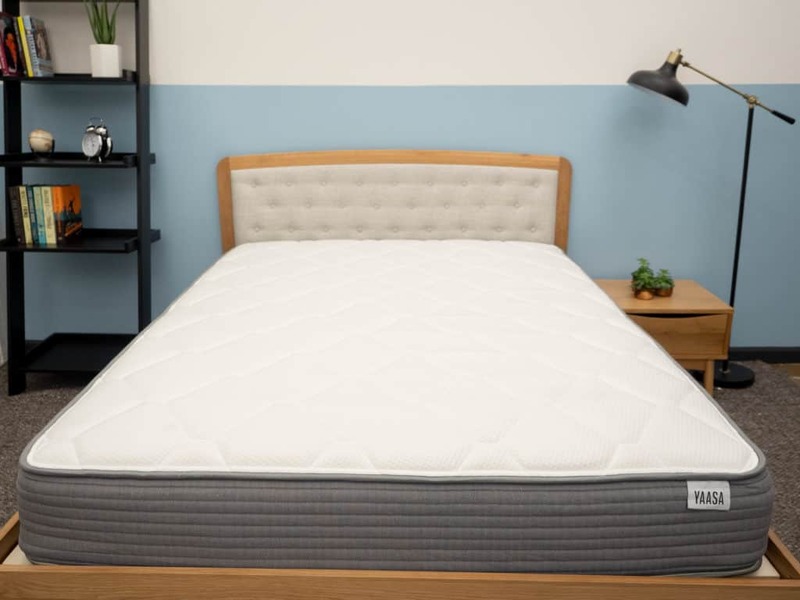 For this review, I’ll be digging into the latest offering from adjustable furniture company Yaasa, the brand new ONE mattress. 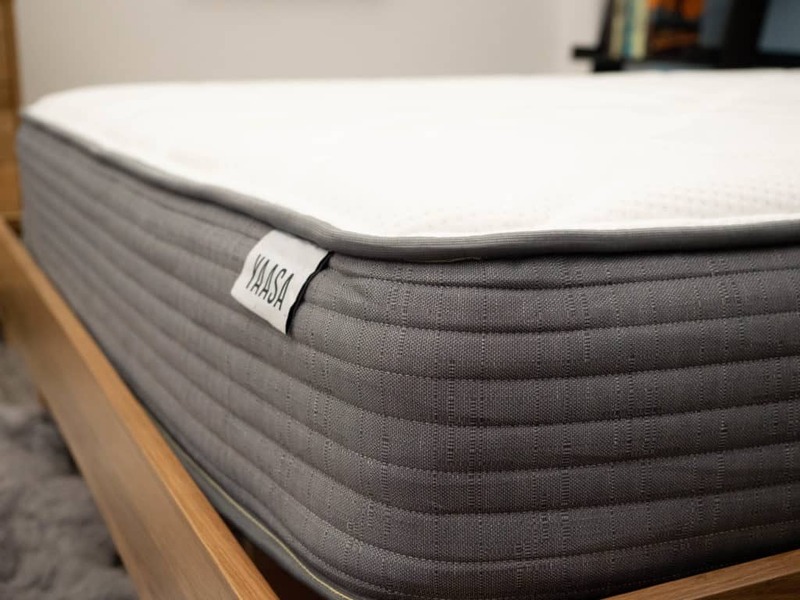 Like the original Yaasa mattress, the ONE features a hybrid construction of foam and pocketed coil layers for a sleep that aims to be as pressure-relieving as it is supportive. But does this new bed stand up to the comfort of its predecessor? I won’t know until I put it to the test, examining its pressure relief, sinkage, and feel to determine what kind of sleep it’ll produce and whether or not it could be the mattress of your dreams. Continue reading below for my full review of the Yaasa ONE mattress. Don’t have time to read it all? Click here to skip to the bottom and check out my review summary. A hybrid construction of foam and pocketed coil layers offer sleepers an even mix of pressure-relief and support. Use code SLEEPONE to save $100 on your purchase of a Yaasa ONE mattress! Now let’s dive into each of these different layers. Cover – The cover is made of a polyester blend that felt soft and cozy under my hand. It fits tight to the mattress, so shouldn’t bunch up as you move around. 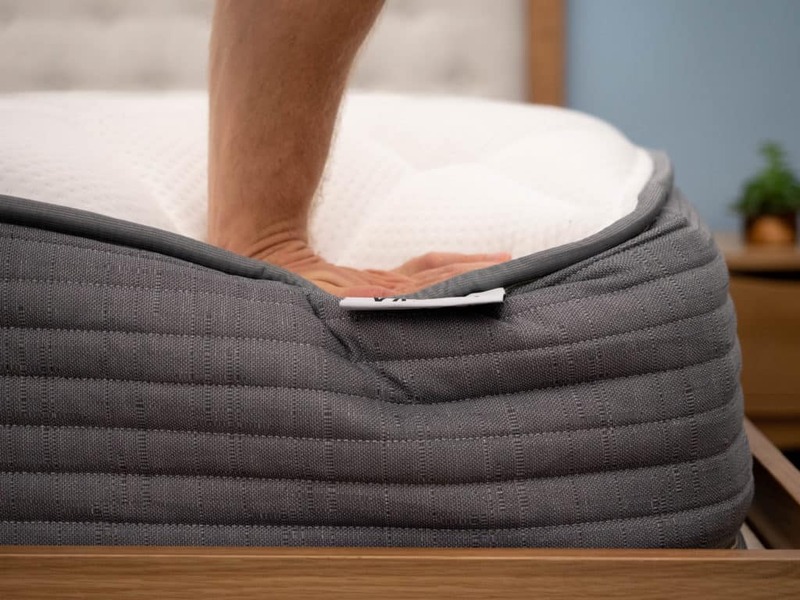 Comfort Layer – Built with .75” of the brand’s cooling Infinity Foam, the comfort layer is technically quilted into the cover to provide some immediate pressure relief to the sleeper. 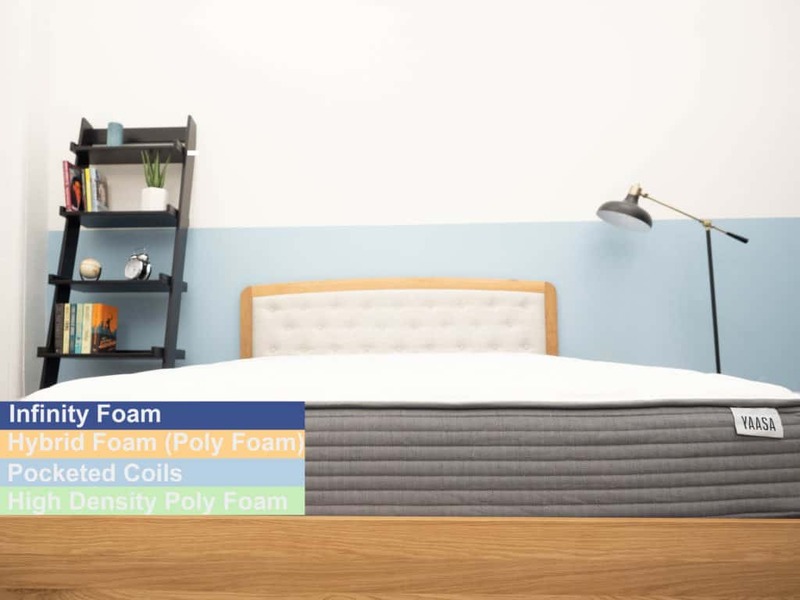 It’s got a gentle feel to it, but is definitely more responsive than a material like memory foam would be, so any contouring or sinkage you may experience isn’t likely to leave you feeling too stuck in the mattress. Transition Layer – Directly below the comfort layer you’ll find 2” of what Yaasa calls its Hybrid Foam. This material is a bit firmer than the Infinity Foam above and is included here to help transition the sleeper into the pocketed coils in the base. Support Layer – The bulk of the bed is made up of this 6” pocketed coil system, which imbues the structure with its stability and bounce. While these coils give the bed a classic innerspring feel, they differ slightly from the traditional material in that they’re individually wrapped. This helps to both encourage airflow throughout the structure and dampen motion transfer. Base Layer – And lastly, we have a .75” foundational layer of high-density poly foam. This section doesn’t really affect the feel of the bed, and functions mostly to give the pocketed coils something off of which to spring. After taking a look at the construction of the Yaasa ONE, let’s chat about the firmness and feel. I started off by applying light hand pressure to the mattress and found that I was mostly interacting with the gentle Infinity Foam quilted into the cover. I could feel myself sinking into this layer for some pleasant pressure relief and comfort. However, as I pushed in further, I experienced the tremendous bounce of the bed, which lifted me up and out of the structure. Since folks of different shapes, sizes, and weights are going to experience firmness in different ways, I decided to bring in three other testers to help me figure out how firm the Yaasa ONE is. To do this, we each took a turn lying on the bed, gave it a personal firmness rating, and then compiled them on the graph below. 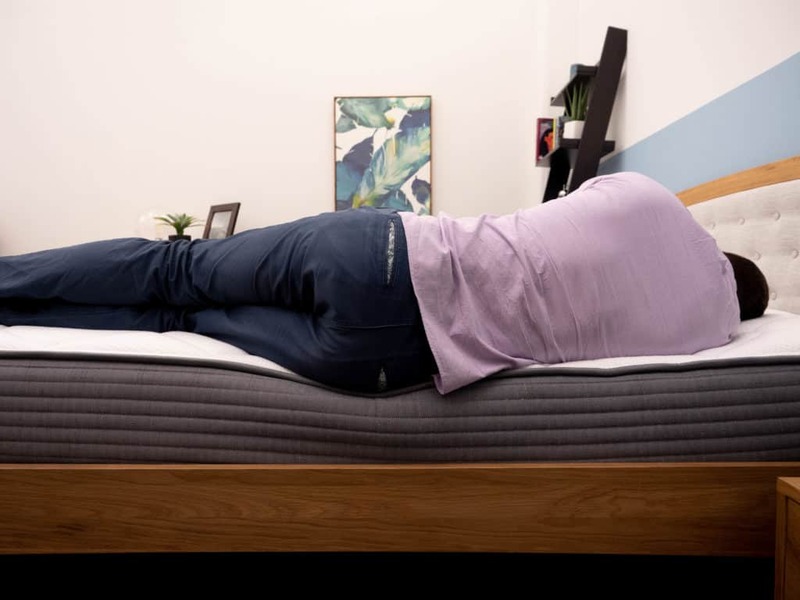 Though feel is always going to be a personal thing, our responses should give you a solid idea of the firmness range you can expect from this mattress. 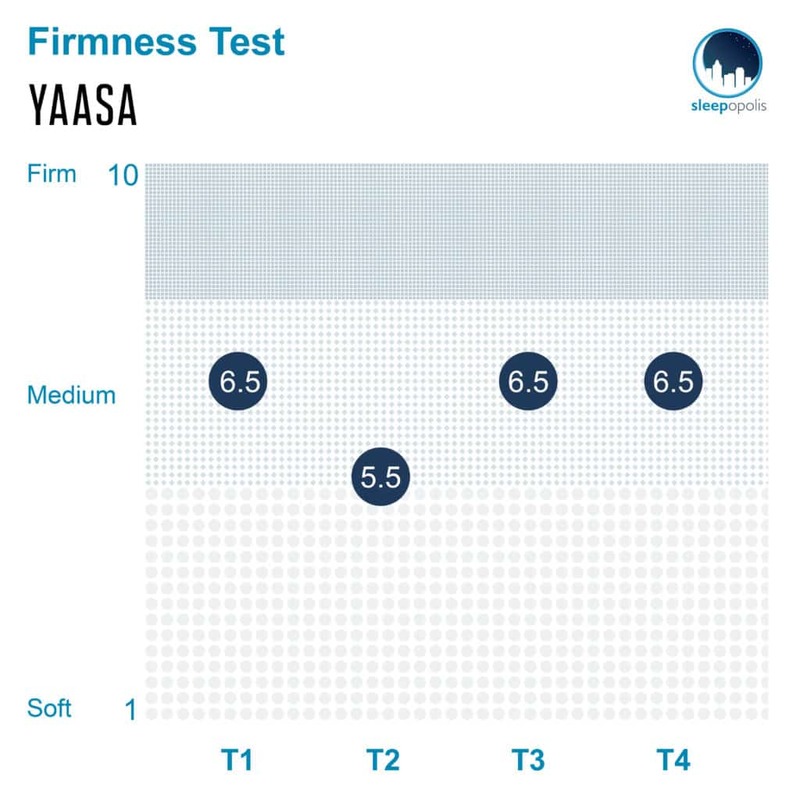 As you can see in the above graph, we were pretty much in agreement about the firmness of the Yaasa ONE, giving it an average rating of 6.25. When compared to the industry standard of 6.5 for medium firmness, it’s clear that this bed is just about medium firm. 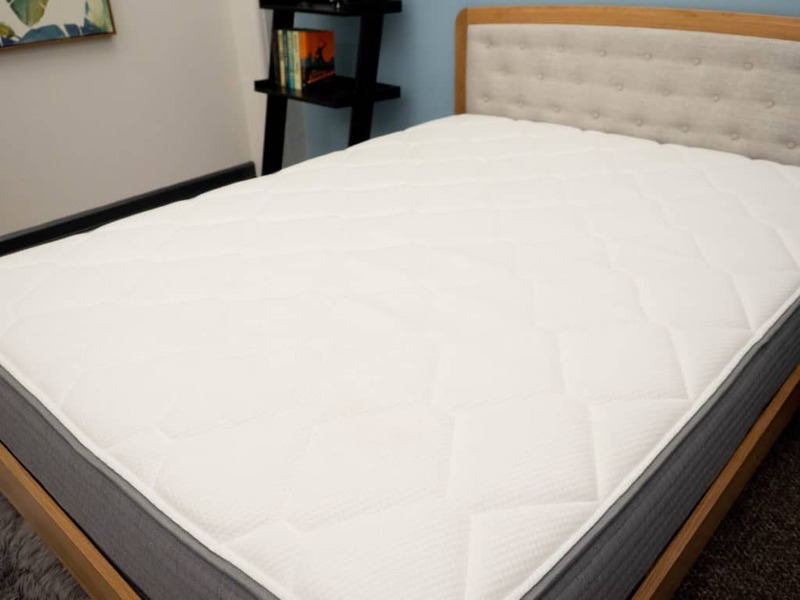 I personally gave the mattress a 6.5 as I found its combination of foam top layers and pocketed coils to produce a feel that was both pressure-relieving and supportive. Additionally, I experienced the bed as quite bouncy, which contributed to its overall medium firm feel. For reference, the original Yaasa mattress received an average firmness rating of 5.75/10 from my testers. While not incredibly different from the score we see here, it does show that the ONE model is a touch firmer than the brand’s original bed. Instead of merely describing the Yaasa ONE’s feel, I thought it’d be helpful to provide a visual representation of where someone may feel pressure points form while lying on top of it. So, I placed a pressure map on top of the mattress and lied on my back, side, and stomach. You can see the results on the image below where pressure is represented from blue (low pressure) to red (high pressure). Back – Lying on my back, I felt some solid comfort as the softer foams up top filled in the space at my lumbar region. Even as I could feel myself sinking into the bed, I found it easy to move around and change positions. Edge Support – Scooting as close as I could to the side of the Yaasa ONE, I was struck by how much I seemed to compress through it. The soft top layers collapsed under my weight and the pocketed coils did just okay at supporting my pressure. Overall, this bed doesn’t have very strong edge support, which could be an important factor for couples to take note of. Side – Turning onto my side, I’d say that I felt pretty comfortable. The soft foam top layers did a fairly good job of cushioning my shoulders and hips, typical side sleeper problem areas, and I didn’t feel too much pressure forming along my spine. That being said, side sleepers tend to prefer softer beds, so the Yaasa One might be just a touch too firm. 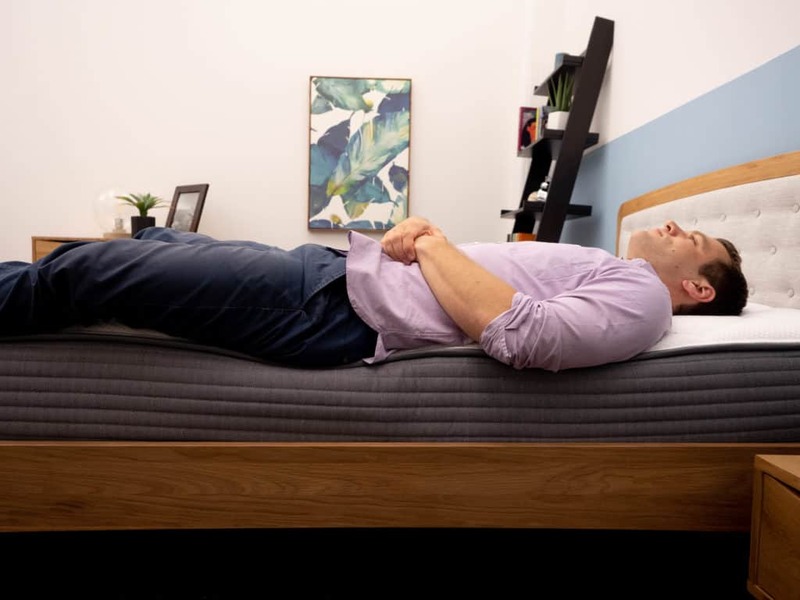 Stomach – Stomach sleepers are kind of the opposite of side sleepers as they tend to go for firmer mattresses that keep their hips and shoulders in a nice, even alignment. Rolling onto my stomach, I could feel my hips falling out of line with my upper body, which caused some discomfort in this position. Up next, we’ll take a look at the ONE’s motion transfer, or the amount of disturbance detectable from one side of the bed to the other. 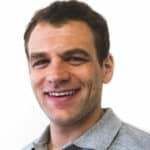 An important test for all sleepers, but especially pertinent for those of you who doze with a partner as it’ll let you know just how bothered you’ll be by their tossing and turning at night. 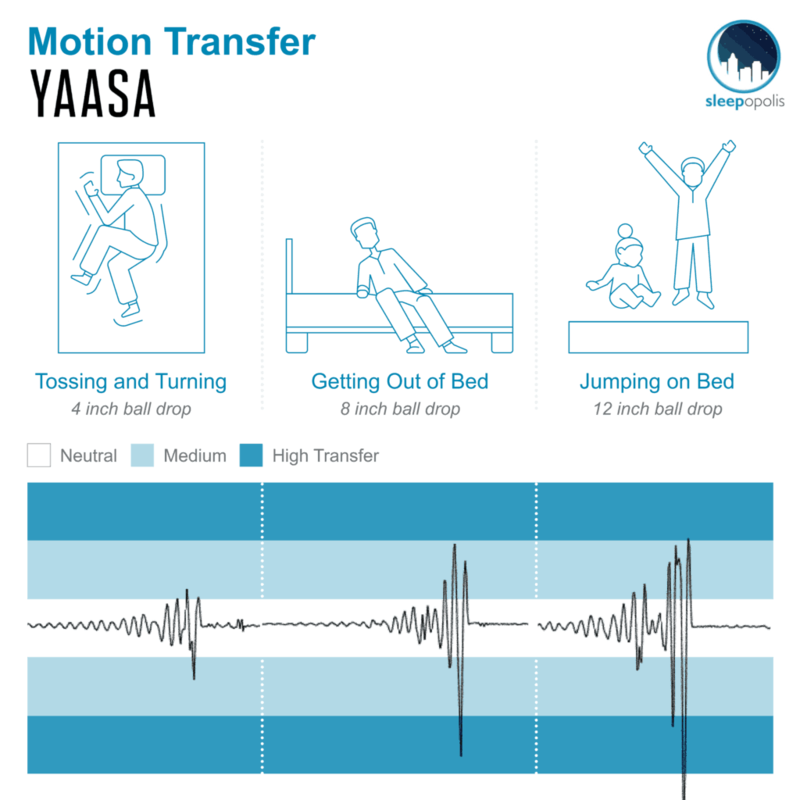 These are pretty good motion transfer results, which tells me you shouldn’t be too bothered by your partner’s movements in the middle of the night. Still, this is an incredibly bouncy bed, so there’s going to be some disturbance felt across the surface. Thankfully, the individually wrapped pocketed coils do a great job of isolating and containing this motion. 6 lb medicine ball: 1 inch of sinkage. 50 lb medicine ball: 4 inches of sinkage. These are fairly average sinkage results consistent with other beds I’ve reviewed. What it tells me is that while you’re likely to sink in through the ONE’s top foam layers for some pleasant pressure relief, the pocketed coil system is going to counteract this sinkage with a buoyant lift that’ll keep you positioned more “on top” of the bed than “in” it. If you’re convinced the Yaasa ONE is the right mattress for you, the size and pricing information for the mattress are below. Please note that these prices reflect standard pricing, but coupons are often available. IS THE YAASA ONE MATTRESS RIGHT FOR YOU? One of my favorite features of this bed is its tremendous bounce, which is likely to keep the sleeper on top of the bed. This buoyant lift could also make it a great fit for combo sleepers who need to be able to move and change positions throughout the night. 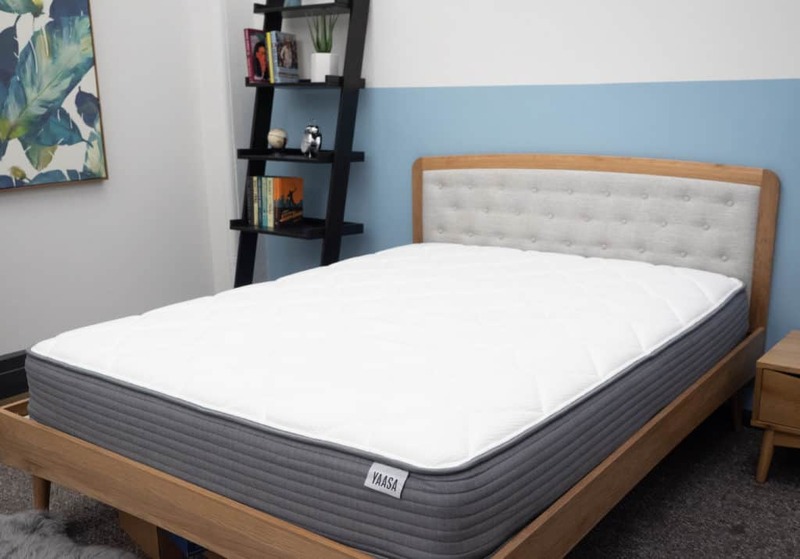 The mattress is also compatible with the brand’s adjustable base, so could be fantastic for those looking for a little extra mobility. As far as cons are concerned, the biggest detractor is the bed’s weak edge support, which minimizes its overall usable surface area. Additionally, the Yaasa ONE slept hot, which surprised me as I found the original Yaasa slept quite cool. For more information on the Yaasa ONE, check it out here! 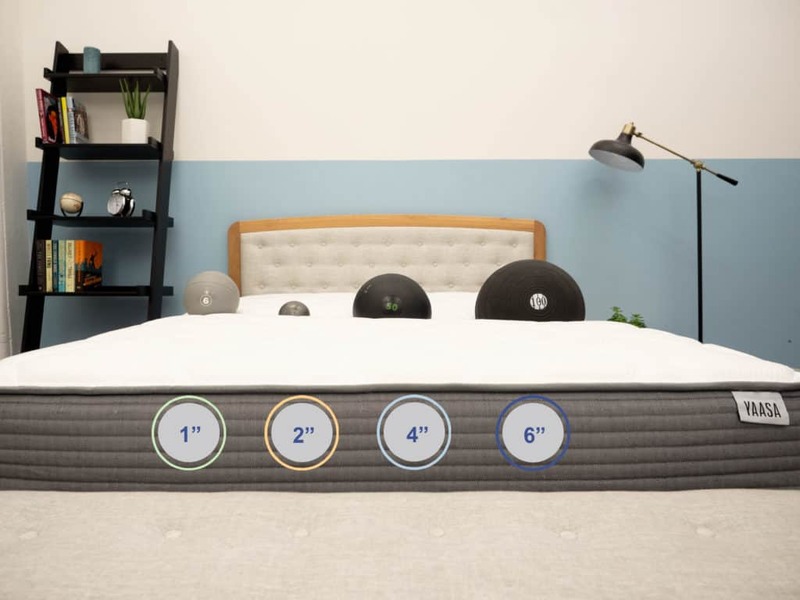 The Yaasa ONE is the second mattress from adjustable furniture company Yaasa. It is a built with a hybrid construction that gives it a medium firmness and a nice mix of comfort and support. 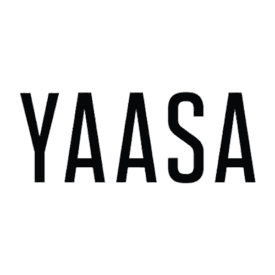 As with the original Yaasa mattress the Yaasa ONE goes great with the Yaasa Adjustable Base, in case you are someone that like to sit up in bed or needs your feet elevated for a good night of sleep.